All departments need to establish an account for an administrator to authorize employees to obtain new or replacement Gator 1 cards. The cost of the card is $15. Departments will be able to view their monthly invoices online. Credentials: PhD, MD, DVM, EdD, etc. Select the payment option: Either the appropriate Chart Field or "employee pays". Department authorizers should notify the employee (Graduate Assistant) when the authorization has been submitted. 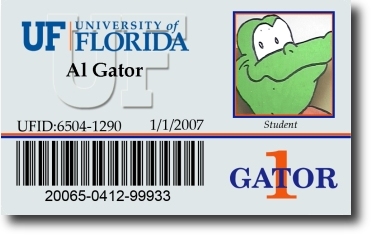 The employee needs to bring a photo ID (eg, driver's license or passport) to the Gator 1 ID Card office. Employee needs to be sure to inform the ID Card staff of an existing authorization. Without an authorization submission, the student/staff employee will receive a Student ID Card. Departments will be charged, or employee must pay, $15.00 for ID Cards as authorized on step 2 above. Employee may pay for new or replacement card with cash, check, debit card, Visa, MasterCard, American Express, or Discover Card. This page was last updated on 10/13/2017.